note that I have used a small pot to do this. You can use any claypot or glass jar that has a cover. The longer you leave it aside, the richer the flavour. For the photos below, its something I have tested and tried and was too eager to try. by 7 days, I have harvested it and it was very sweet. And I tried it again but leaving it to ferment for 30 days. the sweetness is milder but very rich. More refined. My 2 girls loved the fragrance and the flavour. of all the home made wines I have tried and tested, this is one of the best and the ones all of us would drink straight from the cup! 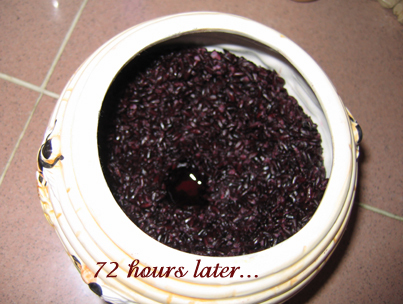 After 72 hours or 3 days, you will see black wine. After 30 days, you will get a nice rich wine. 2. Leave it aside to cool completely before using. At least for 8 hours, if not longer. 3. 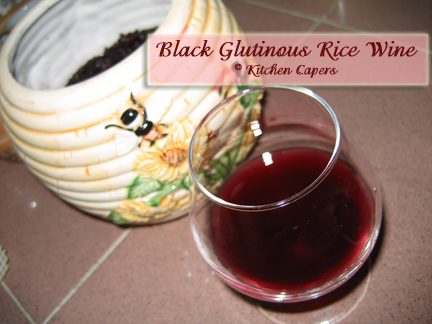 Break and pound wine yeast till powdery and mix it with the rice. 4. Put it in a glass jar and cover with a dry towel and tighten it with a cover. 5. Leave it aside for 30 days. 6. Sieve and drain wine. 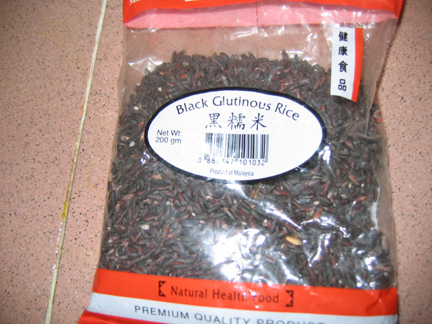 Rice to be discarded as black rice are very hard, firm. The wine should be a dark red like our regular grape wine colour. Its smells like the asian dessert : Pulut Hitam. the taste is very unique, its sweet and the flavour of pulut hitam is very strong. Hi Gina, would this recipe result in the Sweet Black Vinegar that can be used to make Black Vinegar Pig Trotters? Been searching high and low for a recipe to for that. no..its not vinegar as in sour in taste. Its more sweet like wine.